Feel the tingles? Could be shingles! This month, we want to know how you are preparing for the future by investing in your health! Tell us (or show us) what you do to invest in your body, your mind, and your relationships for your chance to win great weekly prizes and a $150 grand prize! To inspire you, we’ll be featuring regular healthy aging content on the Northern Health Matters blog all month long! For many adults, staying healthy means eating a well-balanced diet, staying active and maintaining strong social connections. All of these factors are important, but one frequently overlooked aspect of our physical health is keeping up-to-date with our vaccinations. Do you remember getting chickenpox as a child and suffering from an itchy rash of blisters? Well, when your rash cleared up and you started feeling well again, it was just the virus going into hibernation mode in your body. 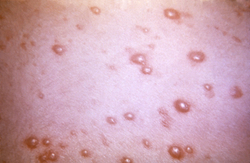 Shingles, or herpes zoster, occurs when the chickenpox virus decides to wake up from its long nap. Shingles can affect anyone with a history of chickenpox, but it is most common and more severe in people over 50 years of age and those individuals with immune systems that have been weakened by medication or disease. The lifetime risk of getting shingles is about 30%. In Canada, it is estimated that there are 130,000 new cases of shingles each year! A rash typically appears on one side of the face or body and may last for 2-4 weeks. Before the rash appears, some people experience pain, itching or tingling of the skin. Early symptoms may also include fever, headache, nausea, chills and sensitivity to light. Approximately 1 in 5 people get severe, long lasting pain known as post-herpetic neuralgia. Your health care provider may prescribe an antiviral medication to treat shingles. It is best to start these medications as soon as possible after the rash appears. Early treatment can shorten the length of time the illness lasts and may keep the illness from getting worse. So, if you think you might have shingles, see a health care provider as soon as possible. What do I need to know about the shingles vaccine? In 2008, a shingles (zoster) vaccine was approved for use in Canada for individuals 50 years of age and older. It is recommended, but not provided free, for people over 60 years of age. Only one dose is need for protection. The vaccine is safe & effective, and has been shown to reduce the risk of getting shingles by 50%. If you get shingles after being immunized, the vaccine can reduce the amount of pain you experience. The shingles vaccine can be purchased at most travel clinics and pharmacies for about $200. Some health insurance plans may cover the cost of the vaccine. What do I need to know about preventing shingles? Shingles is not spread through sneezing, coughing or casual contact. A person is not contagious before the rash appears and once the skin lesions crust over. When a person with shingles infects another person with the virus, that virus will cause chickenpox, not shingles. Chickenpox will only occur in people who have not had chickenpox before, nor been immunized against it. People with shingles should cover their rash, avoid touching their rash, and wash their hands often. Jaime graduated from the UNBC Nursing Program in 2003 and she is currently working as a team lead for Preventive Public Health Nursing in Prince George. Jaime is passionate about health promotion and working with children & families in the early years. Jaime embraces all that northern living has to offer with her husband, two daughters and their Rhodesian Ridgeback, Jake. In her spare time, Jaime enjoys a variety of outdoor activities with her family including gardening, hiking and cross-country skiing. As I watch my 69 year old mom come racing down the local sledding hill with my kids in tow, I am filled with pride and happiness. My children have the opportunity to spend time with their “Nana” in a fun and meaningful way because she is healthy and fit. I could just say that my mom has “good genetics” or “got lucky” but the truth is, my mom has taken care of herself over the years and now our whole family is enjoying the benefits. But what does it mean to take care of ourselves as we age, and how can we put the messages we are hearing into action? It simply means that you take control over your physical health and start making choices that will improve your quality of life as you age. The time to invest in your health is now! What are you doing to invest in your body, mind, and relationships? Start with small amounts of activity and slowly build on your success. Challenge a friend or family member to get active with you. Never give up! Setbacks happen but don’t let them stop you in your tracks. A healthy outside starts from the inside! Get energized for your activities by enjoying a variety of foods. Focus on whole grains, fruits & vegetables, lean meats and lower fat dairy products. Get organized. Planning meals in advance will help you make healthy choices and keep you focused at the grocery store. Stay hydrated. Drinking water throughout the day can help you feel revitalized! Now is the time to take advantage of northern living! Snowshoe in the winter – start slow so you don’t fall in the snow! Walk in the spring – take a friend … there is strength in numbers! Try berry picking in the summer – wear a hat & bring a water bottle! Go for a bike ride in the fall – don’t forget to protect your head! As we enter a new year full of opportunity and hope, I challenge you to put the excuses aside and make a commitment to improving your physical health. It is never too late to get started and become the person you always imagined you could be! Tell us how you are investing in your health for your chance to win great prizes! Invest in yourself … because you can’t afford not to!